Welcome to Caledonia Cottage! I have been selling online for 12 years now and have been lucky to have met many wonderful people. I pride myself on giving good customer service, after all, you worked hard for your money! 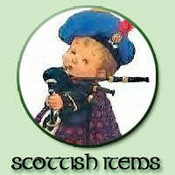 I sell Scottish and Irish gifts and souvenirs and add to my inventory often so please check back. I'm always happy to answer any questions you may have and will usually respond within 1 business day. caledonia_maggie doesn't have any items in their booth! Known Maggie from another venues no longer existing blogs. Have bought from here several times and have always been a happy customer. One of the best sellers Bonanzle has to offer. Been a very happy customer of this great seller for a long time now, very unique gift items you won’t find anywhere else! Maggie’s is the place to shop if you like things Irish and Scottish. Her products are outstanding in quality and her prices just simple can’t be beat. So, happy to see so many familiar friends here! I am a repeat customer. With Maggie, I get the cutest gifts at the best prices! Juat a Wonderful Person! What more can I say! Honest Buyer and Seller! Friend to all! awesome seler.. have known for years on other sites.. Great items and great prices. Excellent customer service! great seller , fast and safe shipping , recommend to all bonanzle !!! Caledonia Maggie is GREAT, I love all her item and her wonderful prices too. Customers Service is topnotch and products are of extraodinary quality. Thank you so much Maggie! She has wonderful items at Extraoridary prices. I love them all and come back for more all the time. Thank you maggie!